Kurt Lux donated 20 Happy Dollars to demonstrate "tremendous respect and gratitude" and thank Phil & Beth Ferrari and their friend, for traveling to Uganda and "working like crazy" for Guiding Light Orphans. Phil Ferrari had 5 Happy Dollars, both for the Red Sox, and for having "quite an experience" in Uganda. Phil expressed his appreciation for having electricity and the clean running water we are accustomed to. While he was in Uganda, the clinic served over 1000 people, and Phil found it notable "how respectful of one another, and of us, the people were, despite their limited access to the "modern conveniences" that we take for granted." He also noted how happy they all seemed, despite those austere circumstances. Said Phil: "It was great to visit, but after seeing much of Uganda, it's really nice to be home." Linda Pendergast was happy to have attended her husbands college alumni reunion at Grove City College in Pennsylvania, and had fun. Linda also informed attendees that a Rotary speaker from last Spring, Marisol from St. Francis Hospital, was awarded $7000.00 in honor of her 9/11 program "My Good Deed." The funds will be used to buy infant seats for those in need. Capri Frank was thankful to be here today. She participated in a wedding at her family's farm last weekend, during which her Auntie Cal's daughter got married. Capri was grateful that all her boys were home and together. At the wedding, her Uncle gave a toast with the theme of respect and appreciation, the sentiment of which which Capri feels is equally applicable in our daily lives. Capri characterized Phils trip to Uganda to be life changing and noted that "we should try to pass it forward." The inimitable Larry Sullivan, teased Capri in noting "we do have respect and you are different." Larry continued noting the new Seasons Magazine included an article about "Logans Legacy." Rotarians may recall learning about the young Logan Schoenhardt who had died from neuroblastoma, after a 7 year illness. Logan's dad started the Logans Legacy foundation to assist families whose children have the same disease to pay for the everyday expenses they face. A Logans Legacy fundraiser will be held December 8th at River View. Logan loved the New England Patriots and their quarterback Tom Brady. During one of his final surgeries, he had the surgeon etch Tom Brady's jersey number into his skull, #12. 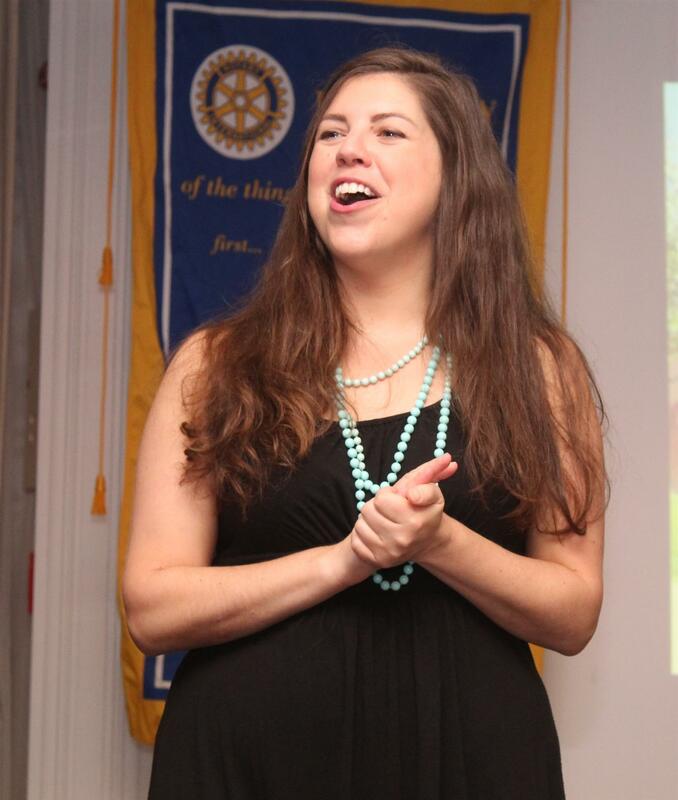 Alicia Canning, noted how happy she is to be part of Rotary and that she has made many friends. Alicia asked for prayers for her 28 year old daughter Sarah, the mother of two of Alicia's grandchildren. 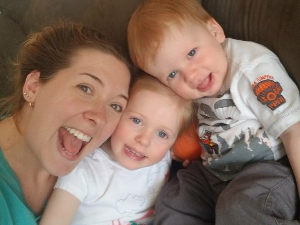 On October 2nd Sarah was diagnosed with metastatic, stage 4 breast cancer and will start pre-surgical, chemotherapy on October 15th. 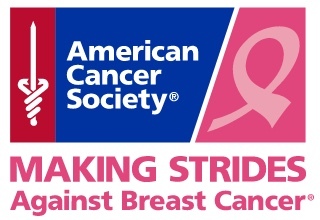 Alicia informed the group that the American Cancer Society will host a team-based fundraising walk on Sunday October 28th, and her other daughter has organized a team of walkers to be known as "Strides for Sarah." T-shirts supporting the event are available for $20.00. Sarah's illness will also be a financial challenge for the family as Sarah doesnt work, and her husband is a school teacher. President Mike Mezheritskiy indicated our Club will help publicize the event and Heather Pantano suggested we donate today's Happy Dollars pot to Sarah's fund. Thereafter this action was approved by unanimous acclaim. 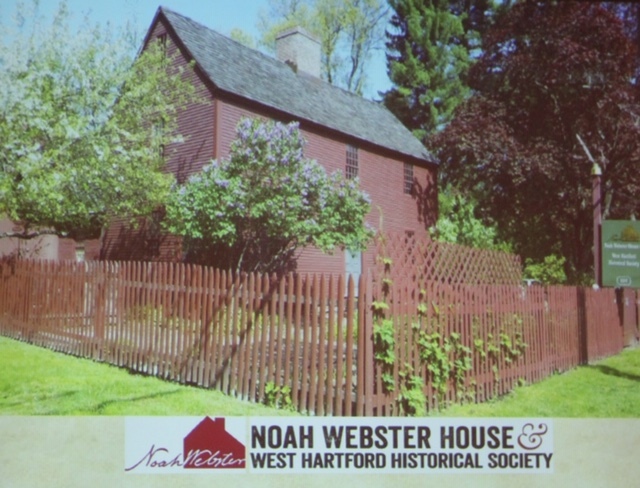 Jennifer Matos, executive director of the Noah Webster House & West Hartford Historical Society opened her presentation by noting that we were just a few days away from celebrating Noah Webster's 260th birthday. 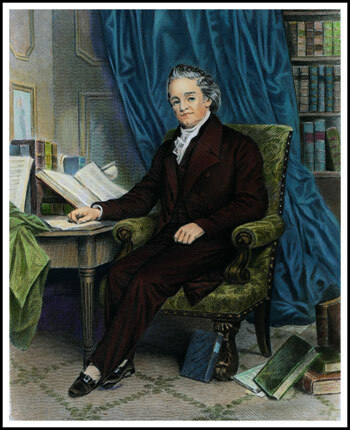 Noah Webster was born October 16th, 1758, a day that today is also known as "Dictionary Day." 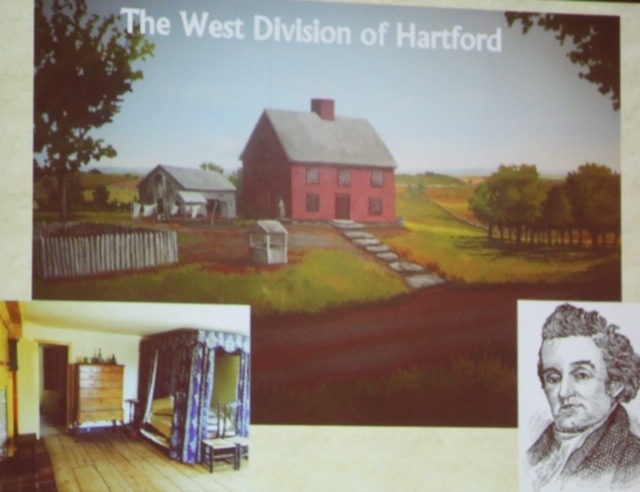 His childhood home, a house on South Main Street in West Hartford, was part of a 200 acre farm in his time. What was then the "West Division of Hartford", a community of just 1000 people, is now the City of West Hartford, home to 60,000 residents. Noah Webster was a true Renaissance man, with notable accomplishments as an educator, convivial political actor, lexicographer, social reformer, religious text editor, scientific thought leader and family man. Webster grew up in a typical colonial family – his father farmed and also worked as a weaver, while his mother worked at home. 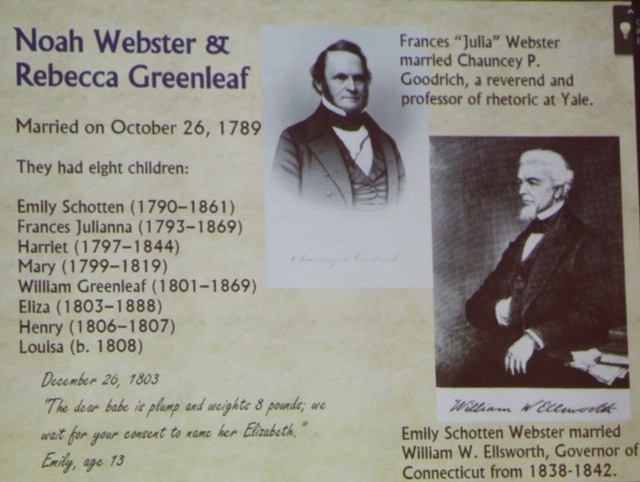 At the time, few people went to college, but Webster enjoyed learning so much that his parents sent him to Yale, Connecticut’s first college. He left for New Haven in 1774 when he was 16 and graduated in 1778. Webster wanted to continue his education by studying law, but his parents could not afford to give him more money for school. After thinking about his options, Webster began working as a teacher. 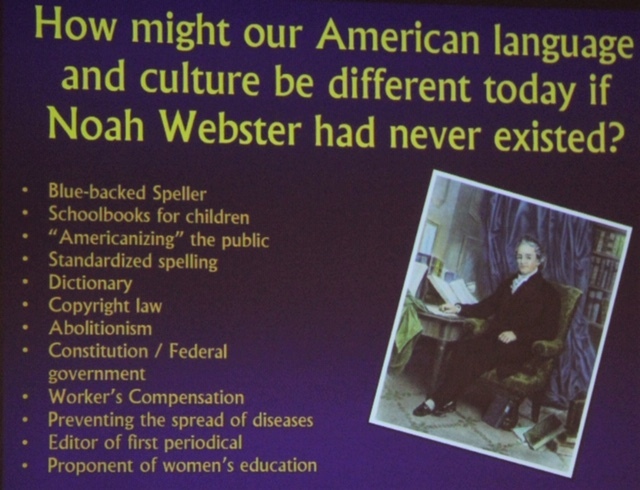 During his years as a student and then as a schoolteacher, Webster realized the American education system needed to be updated. Children of all ages were crammed into one-room schoolhouses with no desks, poor books, and untrained teachers. Although this was after the American Revolution, their books came from England, often pledging their allegiance to King George. 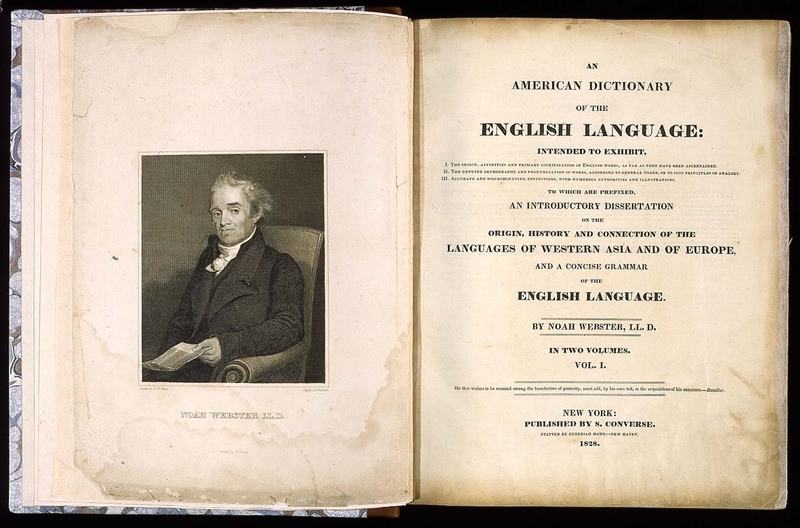 Webster believed that Americans should learn from American books, so in 1783, he wrote his own textbook: A Grammatical Institute of the English Language. 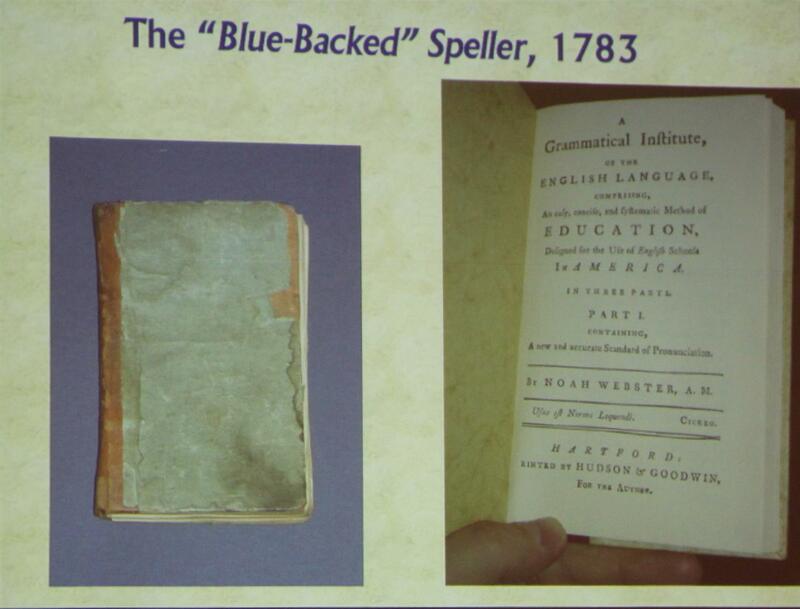 It earned its nickname, the “Blue-Backed Speller”, because of its characteristic blue cover. For over 100 years, Webster’s book taught children to read, spell and pronounce words. It was the most popular American book of its time, selling nearly 100 million copies. 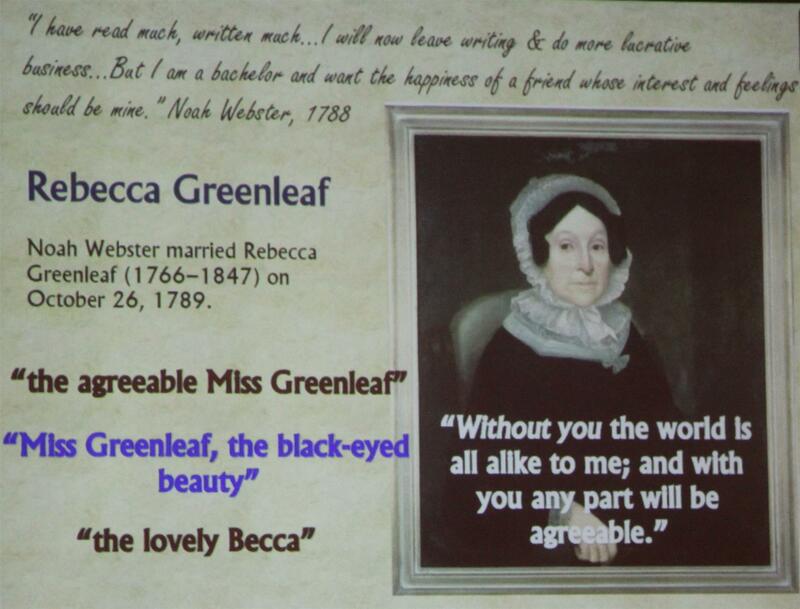 In 1789, Noah married Rebecca Greenleaf, the daughter of a rich man from Boston. During their long marriage, they had eight children and numerous grandchildren. The family lived in New Haven, and then moved to Amherst, Massachusetts. 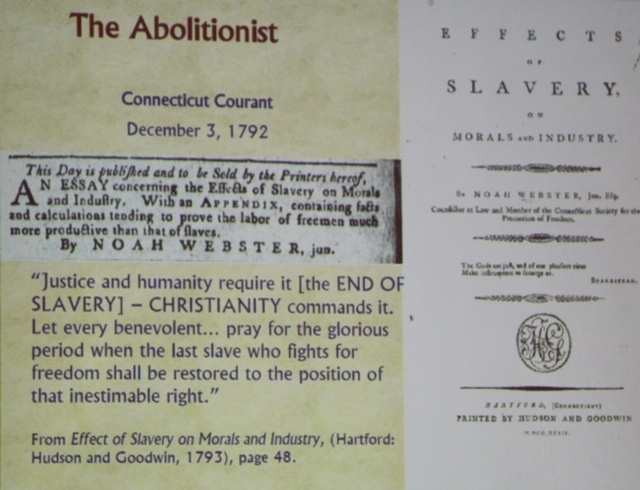 There, Webster helped to found Amherst College. The family later moved back to New Haven. Mr. Webster was raised in the Congregationalist church, and became more deeply religious with age, once stating: "the first duty of Man is to love God." Later in his life he created an edited "American" Bible. In his version, he removed material he thought inappropriate for women and children, as well as references to the British monarchy. Unfortunately for him, this version failed to capture popular appeal and sold poorly. Noah Webster accomplished many things in his life. Not only did he fight for an American language, he also fought for copyright laws, a strong federal government, universal education, and the abolition of slavery. In an effort to protect his intellectual property, he traveled to every state to encourage new laws to protect his work, as there was as of yet no central government to do so. In Virginia he spent a night at Mt Vernon with George Washington, and was offered employment by him. He also became good friends with Benjamin Franklin, by then 80 years old, forging a bond over their mutual love of language. Together they proposed and then effected some changes in accepted word spellings. Noah Webster died in 1843, and was considered an American hero. 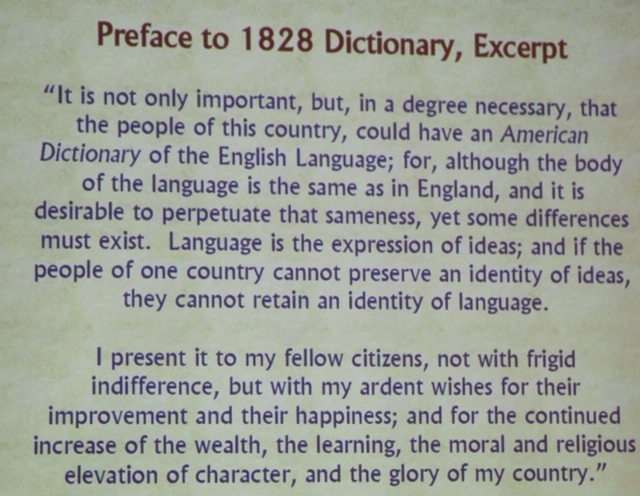 How might America be different today if Noah Webster never lived? Well, for a start he created, led or was involved with the following: the Blue Back speller, new American schoolbooks for children, the "American-ization" of the general public, standardized spelling, the dictionary, copyright law, abolitionism, the constitution and the then new federal government, workman's compensation, disease prevention, as the editor of a periodical and a proponent of women's education. In summary, the accomplishments of Noah Webster are staggering in both scope and breadth, yet sadly, little remembered or understood today. A "birthday party" for Noah Webster was held at the Noah Webster House house on 10/16/2018 which coincided with the opening of a new exhibit, "It Started with Aardvark."